Six times more yeshiva (Torah academy - ed.) students have enlisted in IDF combat units since 2007, according to a report filed by the State of Israel to the High Court on Thursday. 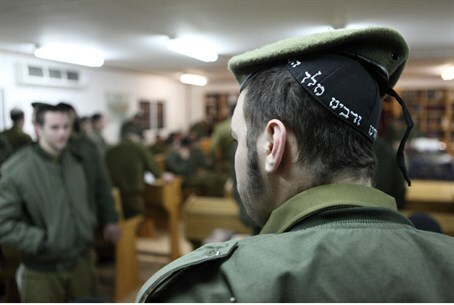 Just 288 yeshiva students enlisted in the IDF in 2007, out of 6,872 up for recruitment. In 2008, the number swelled to 387, or 6% of 6,872 for that year. After establishing the Department of Integration for Haredim in the Workforce, the regular Army recruit rate jumped 10%. In 2010 and 2011 the number of haredi recruit continued to rise. 898 out of 7,562 joined in 2010, and 1,282 joined the following year, out of 7,844. The Tal Law, which gave the option of postponing recruitment for yeshiva students, was abolished in 2012, but the increase in the number of recruits that year was minimal - 1,447 from 8,187, or 18%. In 2013 1,972 of 8,378 yeshiva students were drafted,and from 2014 until mid-May 2015, 2,162 yeshiva students were drafted, from a total of 9,004. Over the past two years, the recruitment rate stabilized at 24%. The data was submitted following a petition by the Movement for Quality Government Conditions for the cancellation of the Shaked Law, or the Equal Burden of Service Law, according to Walla! News. The petition of the Movement for Quality Government was submitted in March 2014, shortly after the law was passed, demanding the court issue an order against the Knesset, government, and Defense Ministry for "severe, unconstitutional, unequal and disproportionate injury [to hareidi soldiers - ed. ], in a bill of fundamental rights enshrined in the Basic Law: Human Dignity and Liberty." .